Harry Mayes, left, and Eytan Shander, right, after announcing their new show on Radio Row in Atlanta. Two familiar names in Philadelphia sports talk radio are teaming up for a new midday show on 97.3 ESPN in South Jersey. Harry Mayes and Eytan Shander, who have been been co-hosting the "Derailed" podcast under the station's banner for the past three months, made the announcement on Friday afternoon. The duo joined forces again last fall after both men departed from 97.5 The Fanatic. Mayes had been at the station for 13 years. Shander, who had been there since 2014, started his radio career for the AM version of 97.3 before it flipped to FM, and also works for SBNation Radio. Starting April 1, Mayes and Shander's podcast will transition to the airwaves daily from 12-2 p.m. The show will follow the national broadcast from Dan Le Batard and precede Mike Gill's show from 2-6 p.m.
"You can expect absolutely zero preparation," Mayes jokingly told Gill from Radio Row in Atlanta for Super Bowl LIII. "Anything is going to be open and fair game," Shander added, noting the show will be as much a place for Philly sports as general topics of conversation. "You're going to have things that you won't hear on your regular sports talk radio show, by design." 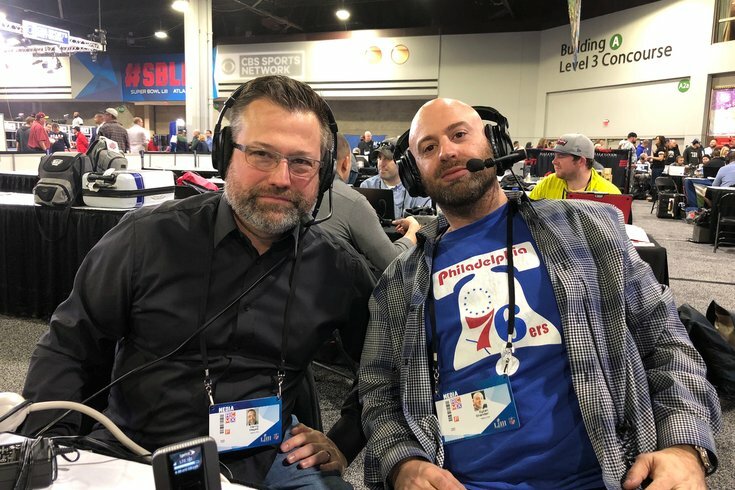 Mayes and Eytan, which will also be accessible via the station's app, figures to compete with midday slots at 97.5 The Fanatic and SportsRadio 94WIP.